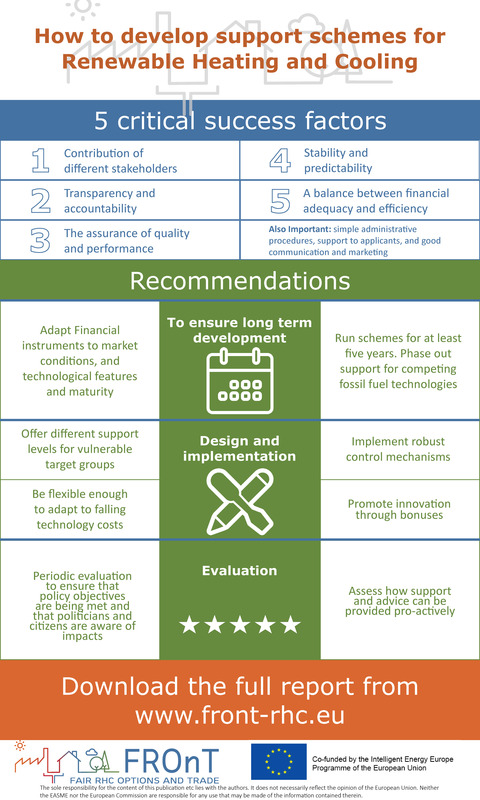 The FROnT manual of good practices provides guidance for policy makers establishing successful support schemes for renewable heating and cooling. It does so in order to help them effectively deliver competitive, affordable, and sustainable solutions for consumers and at the national level. The manual covers technical, economical, financial, legal and marketing aspects, and provides solutions according to various market conditions. It addresses the key success factors for support schemes and gives recommendations to policy makers and civil servants in ensuring long term development, designing and implementing, and evaluating schemes. The external costs of using fossil fuels such as air pollution, and climate change, and the positive externalities of renewables are not currently reflected in the market price of energy. It is therefore necessary to introduce measures to correct market failures, and increase consumer and industry confidence. Responsible for half of European energy consumption and siginificant fossil fuel imports, the heating and cooling sector must be addressed in the transition towards secure, affordable, and decarbonised energy system. Based on assessments of 28 schemes in nine Member States, and developed with public authorities, energy agencies, and industry experts, the report has been published by the FROnT project which is developing tools and studies on how to deploy more Renewable Heating and Cooling. The main factors which are critical to the success of a support scheme are the contribution of different stakeholders, stability and predictability, transparency and accountability, a balance between financial adequacy and efficiency, and the assurance of quality and performance. Other important elements are non-burdensome administrative procedures, support to applicants, and good communication and marketing. To ensure long term development and a sufficiently broad range of technologies, instruments must differ according to market conditions and the technical characteristics and maturity of each technology. Schemes should run for at least five years. Conflicting subsidies, for example to fossil fuels, should be avoided. When designing and implementing schemes, the allocation method and level depends very much on the target group, but some factors are common to all. Schemes must be flexible and include a revision mechanism in order to be adaptable to falling technology costs. Controls must be put in place to ensure quality and performance in order to build consumer confidence in renewable technology. On-going reviews should be put in place to ensure that administrative costs are kept to the minimum for both the consumer and the provider, and that complaints are dealt with swiftly. The periodic evaluation of schemes is important to ensure that policy objectives are being met, and should be used to keep consumers and policy makers well aware of the impact of the scheme.